Dear saints at peace with God: grace, mercy, and peace to you from God the Father and our Lord and Saviour Jesus Christ. Amen. One of the most widespread wars in human history ended seventy years ago. The Second World War included most of the world’s nations, including all of the great powers. Battles took place on land, sea, and in the air. Peoples were displaced, homes destroyed, infrastructure demolished, cities annihilated. Over the course of the war an estimated 50 to 85 million people were killed. When the surrender documents were finally signed and the war was over, people could again return to their lives. Life could return to where there had been nothing but bloodshed. There was peace. In our Epistle today, Paul writes about peace. He writes that we have peace with God through our Lord Jesus Christ. Our war with God is over. We, who were enemies of God, have been reconciled to Him by the death of His Son. There is peace. This was Peter’s confession. Peter confessed that Jesus is the Christ, the Saviour of the world. Peter confessed that Jesus is the bringer of peace. That’s not what the people said about Jesus. The people said that He was John the Baptist, or Elijah, or one of the prophets. They said nothing mean or negative about Him. They don’t say anything bad about Jesus. He’s a good guy, like these other good prophets. Many still say the same today. Jesus was a good religious leader and died for His cause. As long as He is just a prophet, then everything is okay. There’s always room for another prophet. Even the Pharisees were willing to call Him “Rabbi” or teacher. The problem is if He is the Christ, the Saviour of the world. The problem is if He is the Son of the living God who came to save us. The problem is if He is God in the flesh who came to take our sins away and give us peace. The people stumbled on this problem and did not accept the truth of who Jesus is. We see that Peter’s confession was not his own. He didn’t come up with the answer that Jesus is the Christ on his own. It was revealed to him not by flesh and blood, but by the Father in heaven (Mt. 16:17). Peter had very different ideas about peace. Peace would come when Jesus would put the elders, chief priests, and scribes in their place. Peace would come when Jesus would conquer the Romans occupying Jewish territory. There is no peace in suffering! There is no peace in death! That’s what Peter thought. But Jesus responds, “Get behind me, Satan! For you are not setting your mind on the things of God, but on the things of man.” Peter thinks he knows better than God how to bring about peace. That is satanic. It is exactly through Jesus’ death and resurrection that we have peace with God. Our Epistle tells us that we were enemies of God. Not friends that occasionally don’t get along. Enemies. Not colleagues who sometimes don’t see eye to eye. Enemies. Every one of our sins put us as enemies of God. Our sins mean war! Our sins mean screaming-in-your-face enemies of God shouting, “Crucify Him! Crucify Him!” at the top of our lungs. Jesus conquering the Romans would not have helped us one iota. Jesus putting the elders, chief priests, and scribes in their place wouldn’t have meant squat. Neither would it have put us one step closer towards peace. However, taking our sins upon Himself, Jesus takes them from us. Dying on the cross for our sins means taking our punishment on Himself. Instead of declaring war on us, God the Father declared war on His Son. God’s full battle force attacked Jesus instead of us. Taking the full force of God’s war on sin, Jesus saved us from God’s wrath and anger. Now peace has been declared. We have peace with God through our Lord Jesus Christ. We were reconciled to Him by the death of His Son. So there is peace in death. We have peace because of Jesus’ death. There may not seem to have been too much peace in the scourging, suffering, and crucifixion of our Lord, but that is why we have peace. That is why we can mark our graves with “R.I.P.” It comes from the Latin, but the same English letters are also rendered “Rest in Peace.” We can rest in peace because Jesus rested in the tomb after His death for us. Jesus’ three-day rest in the tomb hallowed the graves of all who believe in Him, promising resurrection to our mortal bodies. In Christ, we have eternal peace. My Saviour and my fount of grace. We rest in peace because Jesus ended the war. Amen. The peace of God which surpasses all understanding will keep your hearts and minds in Chirist Jesus our Lord. Amen. Immediately after Jesus’ Baptism, He was driven by the Holy Spirit into the wilderness. After God the Father had proclaimed from heaven “You are my beloved Son; with You I am well pleased,” the Holy Spirit casts Him into the desert for forty days. When the Israelites were wandering in the desert for forty years God miraculously provided them with food and drink: manna from heaven in the morning, quail in the evening, and water from a rock. Yet Jesus had no such miraculous provisions. He goes without food for forty days. Physically weak and exhausted, He was harassed in the wilderness by wild animals. Starving and weak, Jesus was tempted by the tempter, the prince of darkness who is the master of twisting the Word of God to suit his purposes. Jesus was out in the desert to undo what Adam had done in the garden. Adam failed when tested by the devil. He wasn’t starving – He had all the produce of the Garden of Eden to eat at his pleasure. He had all the food he could eat at his fingertips. Jesus was without food of any sort. Adam was in the perfection and comfort of the Garden of Eden. Jesus was in the wastelands of the wilderness. Adam was in the midst of the tame animals he had named. Jesus was surrounded by wild beasts seeking a meal of their own. Adam was tempted by his beautiful wife. Jesus was tempted by the hideous prince of darkness in his vileness and wickedness. Despite all the advantages Adam had been given by God, he fell into sin. Through this one man, sin came into the world, and death through sin (Rom. 5:12). This had to be undone. Sin and death had to be undone. Jesus faced the devil’s strongest attacks and temptations while He was physically weak and starving. Despite all the disadvantages He faced in His temptation, Jesus never sinned. We, however, have followed Adam. Despite all the advantages God has given us, we have fallen into temptation. As we heard in James, every good gift and every perfect gift is from above, coming from God (Jas 1:17). Everything good comes from God. He doesn’t give us anything bad. Yet in return for His blessings we have despised His Word and done the exact opposite of what He commands. It is not God who tempts us to sin. Our own sinful nature has desires that are evil. Our own desires tempt us to sin. When we have followed our own sinful desires instead of God’s Word, we have given birth to sin. When we have not fought our desires but have given in to them, we have given birth to sin. When we have excused our sin as something natural and good because it is accepted by society we have given sin the opportunity to fully grow and bring forth death. “The wages of sin is death.” (Rom. 6:23) We have earned for ourselves death both from this life and eternally in hell. Mark doesn’t record for us the specific temptations of the devil, but Matthew and Luke record some of the temptations and dialogue between the devil and Jesus. Just as the devil had used God’s Word to tempt Eve into sin, so he also used God’s Word to tempt Jesus to sin. So he still uses God’s Word to tempt us to sin. He is the master at twisting God’s own Word to say something that God did not say. Think about how ingenious that is. The devil knows what our weaknesses are. He then takes a passage from God’s Word and twists it to exploit our weakness. He is successful if we do not hold Scripture as a whole. He lifts a passage out of context and twists it to say something that it does not say. When we hear this twisted message, it stokes our sinful desires as the devil knows and intends. The devil wants us to think that our freedom in Christ is freedom to sin, and thus he seeks to destroy us through our own desires as they give birth to sin and bring forth death. It’s not just sinful actions that deserve eternal death, but words, and even thoughts. The desires of the flesh are already enough to condemn us to hell even before we say or do anything. The evil desires of jealousy, coveting, and lust. Sinful thoughts of despair, worry, and doubt. You know the weight of the thoughts alone, not to speak of the sinful words and actions that are given birth by such thoughts. Such thoughts, words, and deeds deserve eternal death. Yet God would not have it so. God does not want us to spend eternity in the death of hell. Thus, He cast Jesus into the wilderness to face the tempter. The temptations and desires that we have not been able to withstand, Jesus withstood. The desires that have given birth to sin in us never even took shape in Jesus. The sin that we have committed that has earned us the wages of death was never committed by Jesus. He faced the devil’s temptations and never even for a split second desired to do what He was tempted with. And it was necessary that Jesus never sin even in the face of the greatest temptations. If Jesus would have sinned even once then He could not have died for your sin or been punished for your sin. Then He would have died for His own sins and received punishment for His own sins. Yet Jesus never sinned. Tempted in every way by the devil for forty days while being parched and hungry, Jesus never sinned. Following Jesus’ temptation, He proclaims, “The time is fulfilled, and the kingdom of God is at hand; repent and believe the Gospel.” The time isn’t near, but it is now. The time is fulfilled. The kingdom of God is here. Jesus has just come victorious from the desert. Despite fierce temptation, Jesus never sinned. Jesus fulfilled the Law for you. For every time you have fallen into temptation, Jesus did not fall into temptation. He took all of your sins onto Himself. He carried the burden and guilt of your sins all the way to the cross where He took the punishment you deserve, dying in your place. That’s why the kingdom of God is here. That’s why the time is fulfilled. What Jesus accomplished in the wilderness by keeping the Law perfectly for you; what Jesus accomplished on the cross by His death for you; this He gives to you freely. Thus He preaches, “Repent and believe the Gospel.” Repent, that is turn away from your sin. Why would you cling to your sins? Don’t cling to your sinful desires. Jesus died for them. Give them to Him, they are His. Don’t allow sinful desires to bring forth death in you. The death you have deserved for your sins has already taken place. Jesus died your death. So believe the Gospel. Believe the good news that Jesus has won the victory for you. Jesus conquered sin, death, and the devil for you. Everything has been done for you to bring you into the kingdom of God. You were baptized into this kingdom. You are kept in that kingdom through the Gospel. You are kept in that kingdom through the Lord’s Supper which gives you the forgiveness of your sins and strengthens your faith. Know that the time is fulfilled. The Law is accomplished for you. Temptation is conquered for you. Your punishment has been taken for you. Jesus has undone what Adam and we have done, and has brought us into His kingdom. So repent and believe the Gospel. Amen. Dear baptized believers whose lives are hidden with Christ in God: grace, mercy, and peace to you from God the Father and our Lord and Saviour Jesus Christ. Amen. We have been getting glimpses of the divinity of Jesus throughout this time of Epiphany. These glimpses show that Jesus is the Son of God; that Jesus is God in the flesh. Magi won’t travel across the world to visit just any baby who is born. Fishermen won’t leave there nets when just anybody calls them to follow. No mere man can teach with authority, heal the sick, and cast out demons. We heard how God the Father and God the Holy Spirit were present at the Baptism of our Lord and revealed that this is no ordinary man. We have heard glimpses of His power, His authority, and His glory. Today, we receive more than just a glimpse. Peter, James, and John on the mountain see Jesus transfigured before their eyes. He is transformed. There is a physical metamorphosis that takes place. The three disciples see Jesus in His glory. They see that the fullness of God dwells in Him bodily (Col. 1:19). Then Moses and Elijah appear and talk with Jesus. The church leaders of that time had accused Jesus of being opposed to Moses, but there Moses stands, next to Jesus. The church leaders had said that Jesus could not be the Messiah because Elijah had to come first, but here Elijah stands, next to Jesus. What an awesome sight! Awesome enough to make the disciples terrified; awesome enough to make Peter speak nonsense about putting up three tents. Jesus visibly shines with the glory of God. There’s no question of His power. There’s no question of His divinity. Jesus radiates with glory like only God can. That’s the Jesus we want. We want the Jesus that no one dares question. We want the Jesus that visibly shines with the glory of God. We don’t want a Jesus who hides His glory. We don’t want a Jesus who hides Himself in water. We don’t want a Jesus who hides Himself in bread and wine. We don’t want a Jesus who speaks through the mouth of a sinful man. We want a Jesus that shows all of His power, so that the entire world can see that we are right and they are wrong. We want the Jesus of the Transfiguration. But as we know, we are headed into Lent. This is not the time Jesus showed His power, might, and glory to everyone around. Jesus was mocked and ridiculed. This same Jesus who showed His glory and might on the mountain, showing Himself to be God, stood silently as He was accused of all kinds of crimes. He was accused of opposing Moses who stood by Him on the Mount of Transfiguration. He was accused of blaspheming the God of Elijah, who appeared talking with Him on the mountain. Jesus just stood there, taking the abuse. They taunted Him. They spat in His face. They beat Him. They whipped Him. They forced a crown of thorns on His head. They nailed Him to a cross and hung Him until He died. Jesus hid His glory pretty well, I would say. But it was necessary for Jesus to hide His glory as He did. If Jesus would have faced His accusers in His glory and defeated them, it would have done us no good. If Jesus would have slain the devil without dying Himself, then we would still be in our sins. Jesus didn’t defeat sin, death, and the devil for Himself, but for us. Jesus had to hide His glory for our sake. 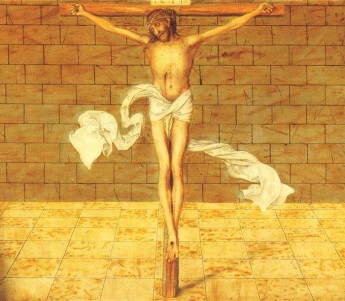 He suffered and died to take our sins on Himself. There was no other way to save us. Our mountain of sins was not going to defeat itself. No matter how many times we try to reform ourselves and do better, we continue to fail. We continue to sin. Our salvation required the death of God Himself. The price of Jesus’ innocent suffering and death is what it took to pay for our salvation. This will be our focus during the season of Lent. Lent is a time of humility and repentance. We replace the glorious white colour of Transfiguration that symbolizes perfection, celebration, and joy with the violet of Lent, the colour of sorrow and repentance. We don’t sing the alleluias. Alleluia is our Easter song of victory and joy. We don’t sing the Gloria in Excelsis – the joyous song of the angels announcing the birth of our Saviour. Dropping the singing of alleluias is an old custom. The old custom included an actual physical burial. A banner with alleluias on it would be processed around the church during the singing of alleluia hymns on Transfiguration Sunday. Then it was buried in a coffin. The coffin would be placed in a visible location where the congregation would see it during Lent. On Easter morning, the congregation would arrive and find the coffin open, and the alleluia banner once again prominently displayed. We may not carry on this Lenten tradition, but we do mute our joy to take time to remember our sins and mourn over them. We remember What Jesus had to go through to save us from our sins. We remember that Jesus hid His glory for us and our salvation. We will be with Christ in the glory that was revealed during the Transfiguration. We will be forever in the eternal glory of God and see Him face to face. And then we will not be terrified of the glory of God as the disciples were on the mountain. The disciples were terrified as any sinful being would be in the presence of the glory of God. But in the resurrection, we will no longer have sin. We will be perfect and pure, as He is perfect and pure. John writes in his first epistle, “We know that when [Jesus] appears we shall be like Him, because we shall see Him as He is.” (3:2) Jesus’ glory is our glory, because we are baptized into Christ. While we await the glory to be revealed in the resurrection, Jesus is with us, although in a hidden manner. Jesus promised that He will be with His Church until the end of the age (Mt. 28:20). We even have His bodily presence in the Sacrament of the Altar. It is necessary that Jesus’ glory is hidden in the Lord’s Supper as it was in His suffering and death. If it was not hidden, we would be terrified as the disciples were on the Mount of Transfiguration. We would not boldly come to the Lord’s Table as Christ bids us to do if Jesus was present in all His glory in the bread and wine. We would be scared to receive the forgiveness of sins because in our sins we cannot stand to see His glory. But Jesus comes to us hidden, and in humble form, because He wants to give us forgiveness. He wants us to receive His Holy Supper often and without terror or fear. The body in which He hid His glory is given to us to eat for the forgiveness of sins. The blood which He humbly shed for us is given to us to drink for life and salvation. But joined in Christ in this way we are joined in His glory that will be fully revealed when He returns. All praise be to Jesus who hid His glory to give His life for us, and still hides His glory to give us forgiveness, life, and salvation. Amen. Dear children of God who suffer from illness: grace, mercy, and peace to you from God the Father and our Lord and Saviour Jesus Christ. Amen. Illness is bad. That’s why Jesus, upon entering the house of Simon Peter and being told that Peter’s mother is ill, touches her hand and heals her of her fever. That’s why Jesus, upon the whole city arriving at the door of the house with their sick and diseased, healed them. Simon’s mother had a fever, which could be very serious especially in those days. She was unable to get out of bed. Jesus grasped her hand, and she was immediately healed. She didn’t need to be lifted out of bed or supported on her unsteady feet as she slowly regained strength. She sprung out of bed herself, and with full energy began to serve them. One minute she’s lying in bed weak and delirious with a high fever, the next minute she’s serving them and making boeuf bourguignon. What a good, wonderful thing! Jesus heals her of this bad illness and everything is immediately better. The whole city rushes to the door of the house. They bring their sick and diseased to be healed by Jesus. People who are suffering from bad diseases are made well. The lame walk, the blind see, the lepers are cleansed. Jesus heals and makes things better, because illness is bad. Or is it? Is illness really bad? Jesus left the city in the middle of the night by Himself to pray. When Simon and those who were with him finally found Jesus, they said that everyone is looking for Him. The news of Jesus healing in the city had spread even further. Everyone was looking for Him. People travelled great distances on foot, carrying their sick and diseased. Mother’s carried their sick infants. Husbands, leaving behind their children with others to care for them, carried their sick wives to be healed by Jesus. Widows brought their only children, the only ones left in their lives, ravaged by serious fever. Jesus, the great healer, did not heal them. He left the city. And when Simon and the others found Him and told Him that everyone is looking for Him, He responds, “Let us go on to the next towns”. If illness is so bad, why didn’t Jesus go back and heal those who sought His help? If disease is such an evil, why didn’t Jesus eradicate the city of disease? And then the next city, and then the next? Jesus gave Simon the answer. He said, “Let us go on to the next towns, that I may preach there also, for that is why I came out.” Jesus said that He came to preach. That is why He came. He came to proclaim the Gospel – the good news of the forgiveness of sins. He came to tell us that through Him, our sins are forgiven. Jesus came to earn salvation for us. He came to promise us eternal life with Him. Jesus did not promise that we will have no illness. He never promised that our lives will be disease-free and healthy. Jesus did not come to heal us now. He came to preach to us about eternal life. Yes, there are many He did heal. Yet there were countless others He did not heal. His primary purpose in coming was not to heal those around Him, but to preach. Despite the healing that Jesus had done in these places, these people did not believe in Him. They looked to Jesus for health in this life only. They looked to Jesus for earthly benefits. Jesus came primarily to preach, but they didn’t care about His preaching. They didn’t heed His warnings to turn away from sin. They just saw the miracles and sought Him for the earthly benefits that they might receive from Him. But Jesus came to preach. He came to forgive us our sins. This is still the same today. He still sends His Word to you. He still sends you preachers to bring you the good news of the forgiveness of sins. He sends you pastors to lead you in studying His Word through Bible classes. He’s given you His Word. We’ve got His very Word in our homes. Most of us probably have so many copies of the Bible in our homes than we don’t know what to do with them all. Yet we neglect His preaching and His Word. We also would rather that He blessed us with temporal benefits than eternal benefits. We skip Sunday services as often as there is anything else offered at that time, whether it be for earthly benefit or merely leisure activities. We won’t attend Bible class where we might actually learn something. We won’t read the Bible at home because it interferes with our earthly priorities. Jesus came to preach, not to heal. Yet we’d sooner take the healing than the peaching. Do you see why we need illness and disease? We desperately need sickness to make us think of God at all. We need weakness and disease to remind us that we need God. We need illness to make us think about eternal life; life away from this world of sickness and affliction. So don’t make bodily healing or this earthly life your highest priority. Jesus has not promised us that in this life He will heal us of all our illnesses, but He has promised us that He will always send us His Word of forgiveness. He has further promised that everything that happens to us is for our good (Rom. 8:28). Thus our illnesses must be good for us. They must be for our eternal good; for our eternal salvation. Jesus will heal us. Maybe not in this life, but our eternal life will be life without illness or disease. Jesus died to save us from this world of sin and suffering. He took all our sin on Himself. He took all our illnesses, diseases, and sicknesses as well. He died to save us eternally from every evil. So we can rejoice in our suffering, because it is through our suffering that He pulls us to His Word, where we receive the forgiveness of our sins. So, as crazy as it sounds, thank God for illness. Illness is good. Amen. The peace of God which surpasses all understanding will keep your hearts and you minds in Christ Jesus our Lord. Amen.